How Can you Prevent your Fistula Arm from being used when Unconscious or Sleeping? When dialysis patients are being attended to, for example visiting the hospital for an emergency or check-ups, nurses may attempt to do needle work (draw blood, IV, injections, etc. ), and take blood pressure on your fistula arm. When you are awake you may be able to prevent this, but who knows if your fistula arm is used while you are unaware due to an anesthetic or while sleeping. The problem is that the system for identifying limbs which cannot be used for medical treatment is flawed. This is because warning signs are often ineffective, communication may drop between healthcare providers, patients are at times unable to speak for themselves, some health professionals are desensitized by multiple wristbands, and sometimes there may be a knowledge deficit on the part of newer healthcare professionals - this can be especially true during emergency situations. The only cuffs one should wear on their fistula arm are "French Cuffs," not a blood pressure cuff (or needle). Compression on the blood vessels or careless needle insertion can cause your fistula to lose its thrill and fail. Sometimes a wristband is put on your arm but unless the nurse closely looks at it s/he cannot tell what it says. Though it may be difficult to believe, if you are not careful a nurse may take your blood pressure or draw blood from the wrong arm, even when appropriately labeled with a medical bracelet. You may be irate after the fact but the damage may have already been done. Recommended Reading: Are Lumps & Bumps On Chronic Kidney Disease-Dialysis Patients' AV Fistulas Dangerous Or Even Deadly? In order to protect your fistula you should consider either asking for or writing a sign in BIG letters saying "No BP or Sticks in Left/Right Arm," and place it above your bed. Also, writing "Do Not Use!" on the arm with a marker, or even on medical tape is a great idea. 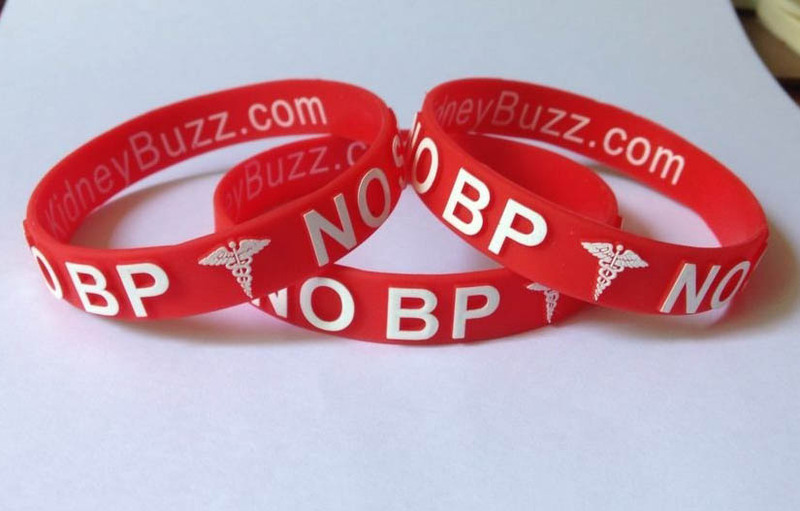 Also, be sure to click here to order your No BP/No Stick Fistula Protector Wristband. The nationally recognized band is well worth the investment. KidneyBuzz.com recommends that whenever you are admitted to a hospital you should attempt to talk to your nursing coordinator on the floor so that s/he is aware of your fistula and ask that your care team be informed.